8"x6" oil on canvas panel $150. on a trip to Museum Hill in Santa Fe. the trees were very tall. so they didn't bleach out. I hope the gate is noticed first. Thanks so much. Hilda. I like knowing that you enjoyed New Mexico. Hi Julie, it's beautiful! I loved your description, "The property must be old because the trees were very tall." Almost poetic, and certainly describes the scene best. It evokes a feeling I can't put my finger on at the moment. Don't want to use the wrong word. Enjoy your day! What a lovely and appreciated comment, Carol. Thank you. I sure hope you are feeling better. Well,it IS tricky, Julie! 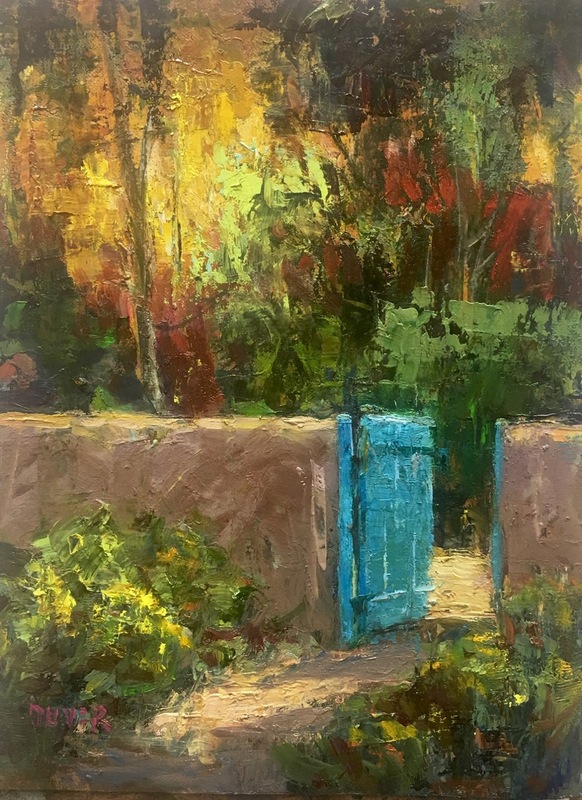 When I first looked, my eye went immediately to the charming turquoise gate and the Naples Yellow spots of light next to it. After reading your comment, however, I looked at it again and this time the bright golden sunlight in the trees seemed to dominate. However, that golden light was echoed in the shrub adjacent to the gate -- clever you! -- so my eye then tracked back through those highlights on the ground to the gate. Whatever route the viewer takes, it is a delight. Good reading of the eye tracking...I always have a problem when two focal points shine forth. As you know...the eye can only handle one at a time. Hope all is well and you are painting. I see the gate as the focus, lovely! The lit walkway going almost to the gate and then past the gate guides your eye so nicely! Of course I love the turquoise of the gate...my favorite Santa Fe color! This is great!!! Beautiful painting, Julie! You managed the light so very well! The light leading up to the gate and the spot of sun behind the gate do indeed make it the focus!! Julie definitely the gate is what drew my attention...I found myself wanting to go deeper into the painting following the path of light. This is absolutely a winner sweet friend. Love it. Hugs!